About a month ago, I was wandering the new and used DVD bins of FYE and came across a sci-fi classic. Yesterday night, I threw it in the player and enjoyed one of my favorite movies from my childhood. There were differences of course, as this was the director’s cut version. But the film was still rewarding to see, especially after a long absence from my mind. That movie was Dark City. I wouldn’t blame you if you’ve never heard of it. Its opening weekend competed with another flick called Titanic. 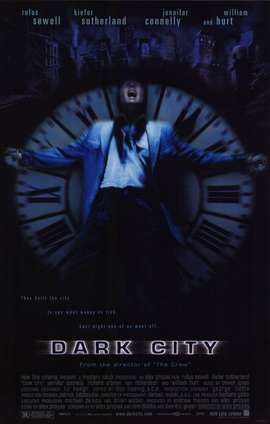 When you think about the shadow that movie cast, you’d realize how ironically appropriate the name Dark City really is. I have to make a note to check out The Thirteenth Floor. Dark City financially failed. But it planted the seed of an idea in our minds. Inspiration and creativity come from places we sometimes forget. Stories we used to hear, the movies we watch, all are sources of ideas. Sometimes the greatest ideas just aren’t well told the first time, like a draft in need of improvement. And sometimes, even the worst ideas make for great stories. Like Don Quixote. Sometimes, a terrible idea is the start of a great story to write. Whether or not you throw in a character who opposes that idea is up to you. This entry was posted in Musings and tagged Avatar, Christopher Nolan, Dark City, Don Quixote, ideas, Inception, Leonardo DiCaprio, Memento, sci-fi, Surrogates, The Matrix, The Thirteenth Floor, Titanic, writing. Bookmark the permalink.